The head of the U.S. Coast Guard said Thursday that his fleet is at a readiness “tipping point,” waiting for new vessels to replace an aging fleet. Increasingly, personnel are being asked to do more around the world with aging platforms and infrastructure, Commandant Adm. Karl Schultz said during the 2019 State of the Coast Guard address from Base Los Angeles-Long Beach. “Our people answer the call, every single day,” he said. 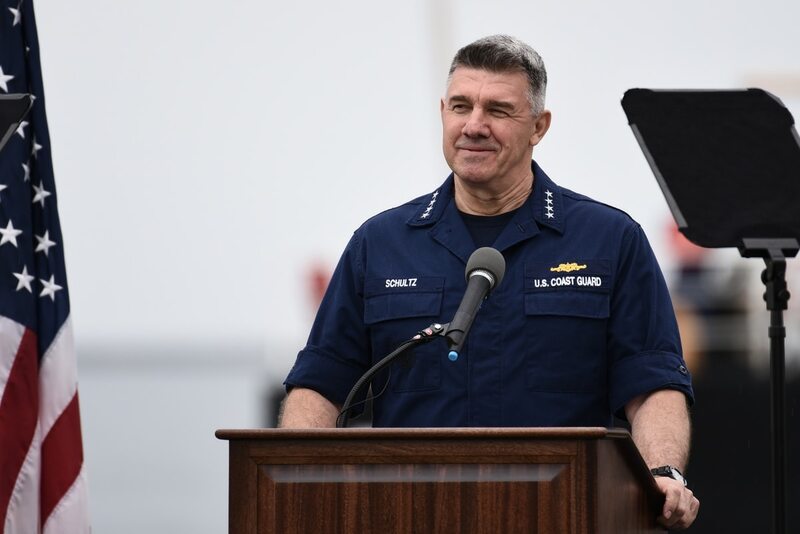 Like his fellow military service chiefs, Schultz indicated in his roughly 45-minute speech that the key to modernizing the Coast Guard is a steady level of funding. Schultz said the Coast Guard must deal with a deferred maintenance and infrastructure backlog that exceeds $1.7 billion. Modernizing infrastructure is particularly challenging because his facilities pepper the globe, he added. “As Congress makes tough fiscal decisions and looks at the best ways to spend the nation’s precious resources, there’s not a better return on investment in government than the United States Coast Guard,” said Schultz, who assumed the duties of the 26th Commandant of the United States Coast Guard on June 1, 2018. "Surf station" is a ranking of the worst-of-the-worst in terms of seas and weather. Schultz praised his personnel for standing fast during the 35-day government shutdown that left members unpaid. He also applauded community members who stepped up to aid Coast Guard families with essential goods and services. Schultz said the Coast Guard is preparing to award a $675 million contract to fully fund the Polar Security Cutter project, the service’s new heavy icebreaker. He shared the woes that come with keeping the service’s last heavy breaker, the 43-year-old cutter Polar Star, running. During a recent mission to Antarctica, the Polar Star not only caught on fire but suffered a glitch that allowed seawater to enter the vessel. Hundreds of miles from port, Navy and Coast Guard dive teams went underwater to patch the problem while crews wading through 30-degree bilge water repaired the ship from inside, he said. “Every year I observe this type of innovation and dedication to mission excellence,” Schultz said. Schultz pointed to the 132 crew members of the California-based cutter Stratton who operated from the Arctic to the coast of Colombia during a 104-day deployment, a patrol that performed missions ranging from interdicting narcotics to enforcing maritime safety standards. To him, they were just one example of a Coast Guard crew that operates worldwide to accomplish many different kinds of assignments. He praised a Coast Guard crew member born in Haiti who helped translate directions to a boat overloaded with refugees and the inspector who found cracks in a massive oil tanker that could’ve triggered a major oil spill at an American port. He updated the audience on cutter Bertholf’s deployment to the Western Pacific to combat North Korean efforts to evade maritime sanctions. He said one of his cutters was preparing to offload about 26,455 pounds of cocaine ― 12,000 kilograms — that had been seized in recent weeks. “Our missions have never been more relevant or demanding than today,” Schultz said. Congress passed a spending bill on Feb. 14 and President Trump signed it into law, securing funding for at least one breaker. While the Coast Guard continues to perform a diverse set of missions, Schultz indicated that more must be done to ensure more minority and female crew members stay in the ranks. A study that tackles the low retention rate of Coast Guard women is slated to be released next week, he said, and the service will launch a similar investigation into why minority members leave the ranks. Schultz said that reforms to convalescent leave will benefit new mothers and he hoped that other changes — from easing tattoo regulations to removing single-parent enlistment disqualifiers and revising outdated weight standards “that disproportionately affect women” — might keep more women in uniform.